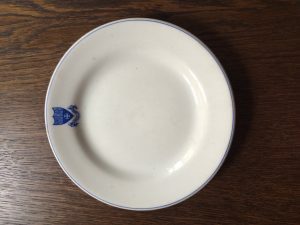 A china dinner plate dating from the late 19th century. It is very unlikely that this would have been used on a daily basis but it would have been brought out for more formal occasions such as Speech Day and end-of-term dinners. This particular plate was found under the floor of the kitchens during renovations along with cups and beakers.